At City Vocal Coach, we are firm supporters in the benefits of writing your own material. We’re also fans of collaborations. We believe that while it is important to understand your own creative journey, collaborations can be such an important tool for songwriters. The likes of John Lennon and Paul McCartney, Jimmy Page and Robert Plant and Paul Simon and Art Garfunkel are testament to just how successful a co-write can be! But if that isn’t enough to convince you, we’re going to delve into the reasons why it’s such an important tool for your songwriting. When you’ve got your songwriting process, you can – all too easily – get stuck in a rut. And this rut can only be worsened with the appearance of writer’s block. However, when you work with other songwriters this can not only prevent you from getting into said rut, but also help with writer’s block. You become influenced and also an influencer. And this is the rather magical world of collaborations, as these influences can be anything from style of music, lyrical choice to even instruments. Combining your different writing methods can lead to wonderfully unique creations as well as help to stir up your creativity, forcing you to take more risks with your writing. As with any aspect of life, it’s made better with people. Collaborating with other musicians and artists gives you that chance to build relationships, network, and network some more. After all, in any industry, it’s always who you know. The more connections and bridges you form the more you’ll collaborate, and the more people in the industry you know, the better positioned you’ll be to get your music out there. Admit it, with a deadline looming you’ve no doubt indulged in the rather tempting act of procrastination. We’ve all been there. It can be easy to push your thoughts about deadlines to the side for just a little while longer. However, when deadlines do not focus solely on you and include other people, this can be a great motivator for you to reach them. 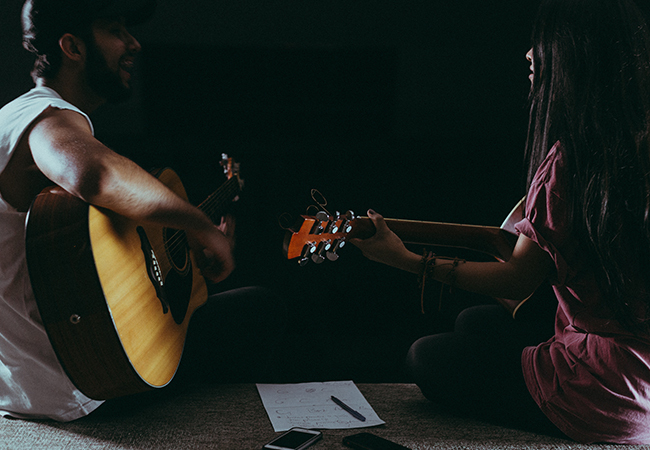 Collaborations will mean you’ll set aside a day, or two, and focus on writing a song within that time with your co-writer. A collaboration gives you the chance to express your ideas in front of someone else. Whatever you take with you to your writing session, whether you just have an idea you’re eager to write about, a few lyrics or even part of the tune, your co-writer will provide you with instant feedback. Even better this feedback will be in-progress feedback, which means it will evolve as you both work on the song. And this can be a really useful way to work, as you’ll receive instant gratification or constructive feedback there and then. Leaving more room for the ideas to flood on in. Collaborations will expose you to other musical influences, help you to network and build relationships, as well as improve productivity and open you up to more feedback – and these are just a few of the reasons why collaborations are such an important tool for songwriters.